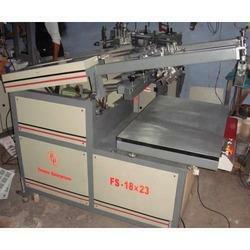 We are leading exporters and manufacturer of Semi-Automatic Screen Printing Machine. Superior print quality, ease of adjustments, simple operation for multicolour are some of the reasons why our Machines are the most trusted ones of the industry. We are manufacturer of semi automatic lanyard screen printing machine for single color. 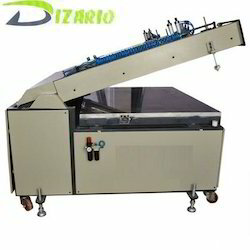 This is 3 roll semi automatic lanyard screen printing machine, you can print 3 rolls at a time. you can print approximately 500 to 700 lanyards in 1 hours time depends on impression size. this machine comes with 1 hr invertor backup. - Suitable for Flat articles like jerrycan. APL semi auto Screen printing machines which are economical and high speed then other machines. These machines are basically used for graphic industries and PCB. These machines do not require air-compressor. Printers get wider space for loading the paper. These machines are very good for UV spot coating. We are leading exporters of Semi-Automatic Flat Screen Printing Machine. Superior print quality, ease of adjustments, simple operation for multicolour are some of the reasons why our Machines are the most trusted ones of the industry. Screen Printing: 15" X 20", 18" X 24" and 20" X 30"